I suppose it is only appropriate that the Tri-Lamb Group arranged for three Lamb Suppers. I am sad that we have reached the end though. Unlike the Godfather, the final chapter of this trilogy may have been the best! 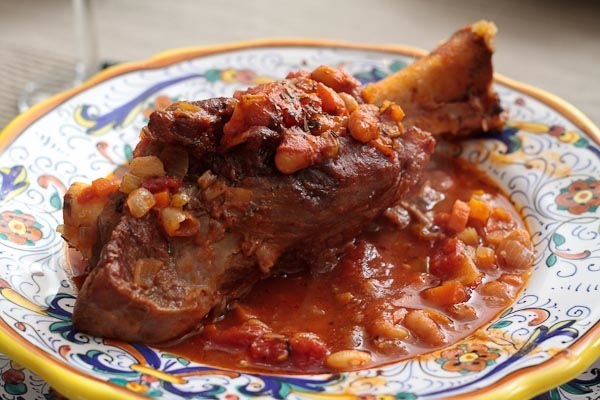 The Braised Lamb Shank is an excellent winter recipe. The dish is warming and hearty, and very satisfying, even if DC’s winter temperatures are unusually high. Since this dish is finished with a long braise in the oven, it is also the perfect dish for a large crowd. This was actually our largest dinner yet, with a total of 10 people enjoying delicious lamb. We had so many dishes that I am going to have to do another post to cover it all. 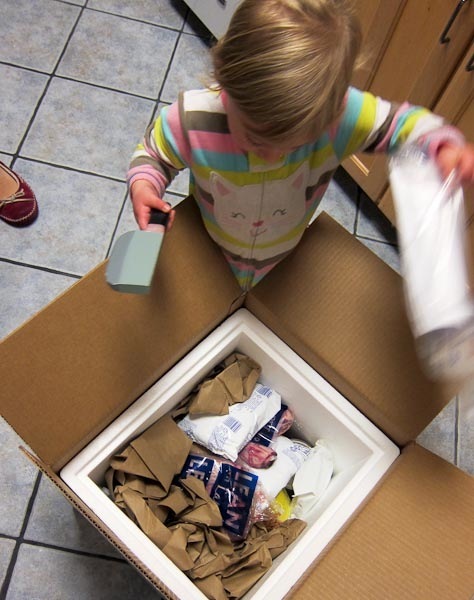 Elena wanted to help pitch in and used her toy knife to help “cut-up” the lamb. Very helpful indeed! I always love to tinker with recipes, so I of course couldn’t leave this recipe alone. Instead of using canned beans, I made my own batch of canneli beans. Making your own beans makes it much easier to get a nice soft texture. 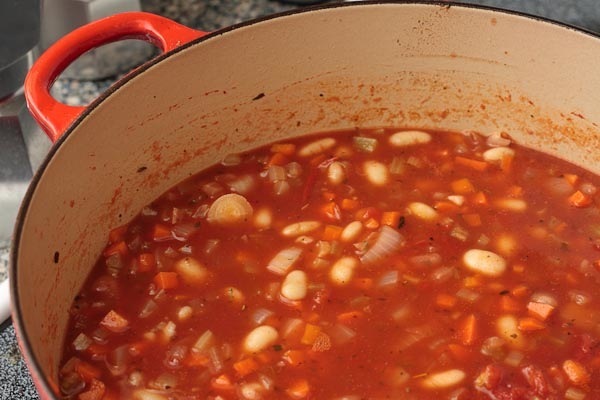 You can also use the bean broth as part of the braising liquid, it is packed with flavor. 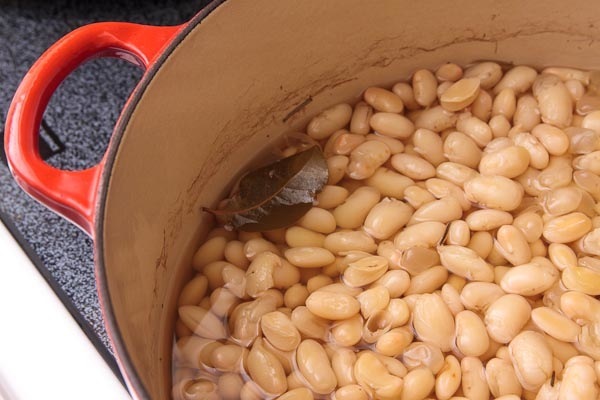 To get the best possible texture, soak the beans the night before. Also add lots of salt to the beans. 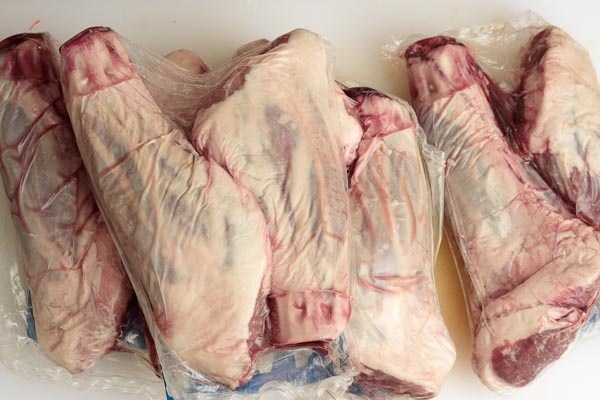 One step that the original recipe left out is removing the silver skin from the shanks. The silver skin is membrane on that holds muscle groups together. It is pretty easy to remove, simply slide a knife between the muscle and the membrane and go to town! I also trimmed off most of the fat. The first step was to salt and brown the meat. The recipe is a little optimistic on the amount of meat needed per person. We had eight shanks for ten people and we had one left over at the end of the night. It seems like a lot of meat, but the bones weigh quite a bit. Since I was dealing with so much lamb, I used two dutch ovens, but I still had to do two batches. After that you have to sautÃ© the vegetables with the tomato paste and herbs. I went all fancy and diced everything. It was a pain. I am sure a good chopping or slicing would have worked just as well. Finally you add the wine, broth, diced tomatoes and the beans. I also added in the bean broth. Once you add the shanks back in, it is time to get the dinner party started. All of the work for this dish is done, you just have to let it braise in the oven for a couple of hours. 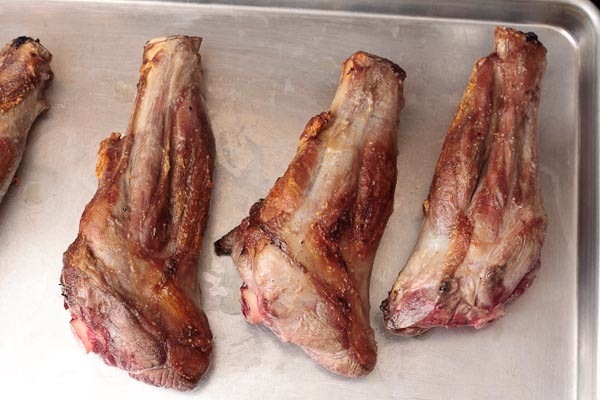 One of the reasons that dish comes out so good is because it is cook with the bones. Having them in there adds a lot of body and flavor. It probably has something to do with the marrow or something like that. Either way it is good. 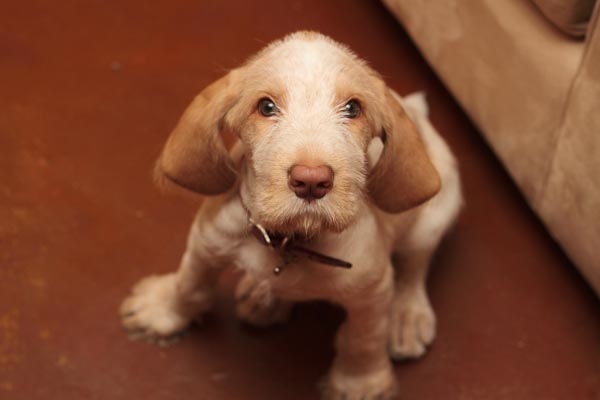 Our downstairs neighbors recently got a new puppy. 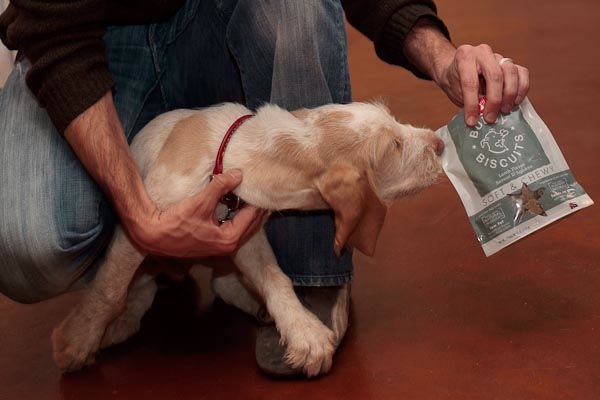 Luckily one of the guests was extra thoughtful and brought lamb flavor treats. No one goes without lamb during a Supper Club! Preheat oven to 350 degrees. Heat oil in a large Dutch oven over medium-high heat. Season lamb shanks with salt and pepper. 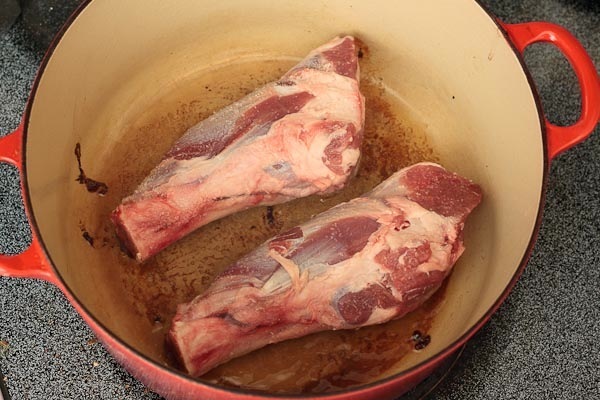 Add the shanks to hot oil and cook, browning each side, about 4 minutes per side (if necessary, cook in batches). Remove shanks to a clean plate and set aside. 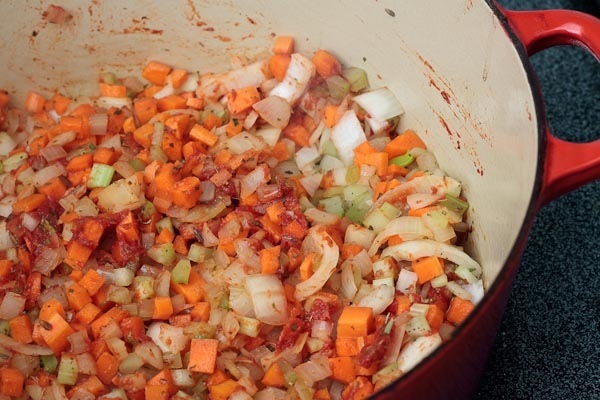 Add onion, carrot, celery, tomato paste, herbs de Provence, garlic, 1/8 teaspoon salt and 1/8 teaspoon pepper, cook until softened, about 5 minutes. Add wine, scraping up any brown bits on the bottom of the pan. Add broth, tomatoes and beans; bring mixture to a simmer. 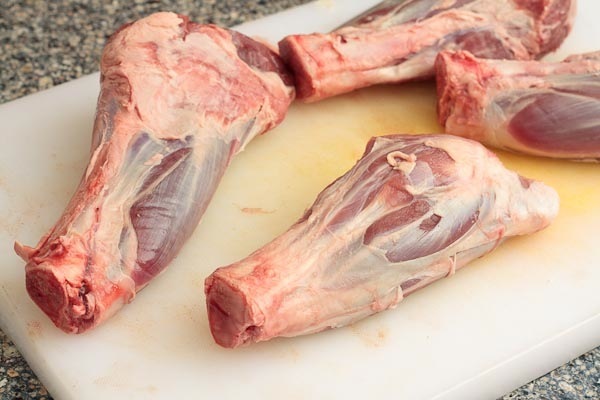 Nestle browned lamb shanks into broth mixture; cover and cook in the oven until the meat is tender and easily falls off the bone, about 1 1/2 to 2 1/2 hours depending on size of shanks. Place shanks in individual shallow bowls or plates. Divide vegetables and sauce among bowls. So excited to try this tomorrow night! Thanks for letting us know about removing the membrane, great tip! Wish I could have tasted this. Sounds Yummy.